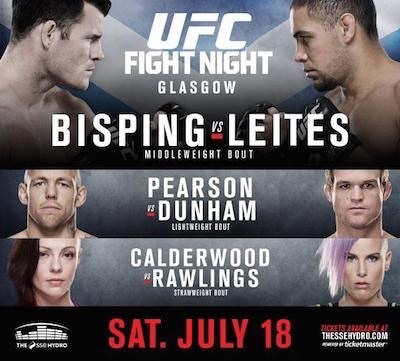 Ahead of UFC®’s highly anticipated debut event in Scotland, UFC FIGHT NIGHT®: BISPING vs. LEITES, the organisation has today confirmed a series of fan events which will take place during the lead up to the event on Saturday, July 18th. On Wednesday, July 15th fans will have the opportunity to watch their favourite fighters from the UFC Fight Night Glasgow line-up train, as UFC hosts an exclusive open workout evening at The Old Fruitmarket in Glasgow. Fighters including Michael Bisping, Thales Leites, Joanne Calderwood, Stevie Ray and Robert Whiteford will all take part in individual workouts in front of fans and media, as well as facing off against their opponents for the very first time. On Friday, July 17th fans are invited to attend the official UFC FIGHT NIGHT®: BISPING vs. LEITES live weigh-ins at the SSE Hydro. Doors will open to UFC Fight Club™members at 12:00, with general admission following at 12:15. Ahead of the fighters stepping onto the scales, there will be a live Q&A with UFC guest fighters, between at 12:45-13:30, while an autograph signing will follow between 14:30-16:00. The weigh-ins, Q&A and fan signings are all free to attend and open to the public. Details: Free to attend and open to all.